Properly brushing your teeth from a young age is incredibly important. Children's teeth will fall out and adult teeth will come through eventually but that shouldn't stop us from ensuring our children know how to look after all their teeth. D has been learning about how to properly look after his teeth and why that is so important over the last few weeks. 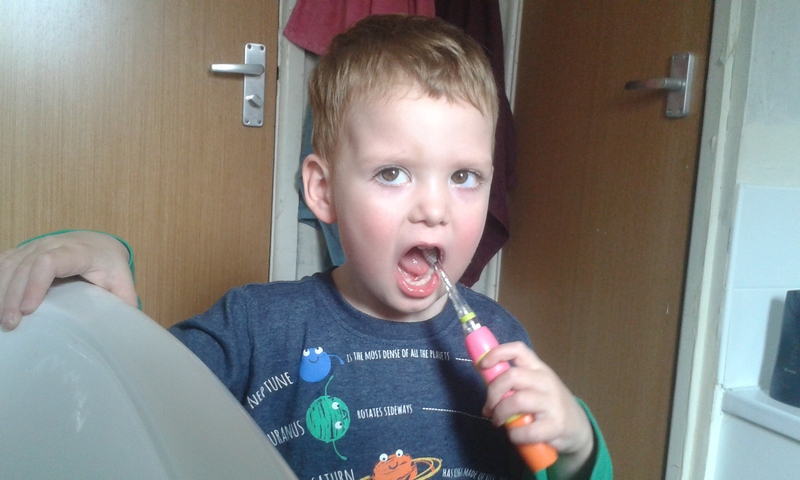 When I was contacted about reviewing the brush-baby KidzSonic Toothbrush and Tutti Frutti Toothpaste, I knew the timing was perfect for D to move onto an electronic toothbrush and to learn more about the brushing process including how to properly brush his teeth. D has always had a great interest in brushing his teeth. From about 1-year-old he enjoyed holding his toothbrush and biting down on the bristles while giving it a bit of a wiggle (I was brushing them properly after). At around 2 - 2 1/2 years old D had almost all his teeth and we would spend a good amount of time in the bathroom morning and night learning how to move the brush properly inside his mouth to actually clean his teeth himself. He got the hand movements down and was happy to just continue on and brush at the same time I was in the morning and then at night before bed. However recently I had noticed that D wasn't pushing down on his toothbrush enough to clean the bottom of his teeth. While we where telling D that he wasn't brushing properly and that his teeth would still decay if he didn't make sure he was cleaning all of his teeth properly he had a lot of questions. He most importantly wanted to know why it was important. His questions made sense, he wanted to know how and why he had to do this every day. We started to spend the time before and after brushing talking about a question or two that he asks about brushing. At the start the questions were very simple, "Why use toothpaste?" or "Why do I brush my teeth?" are two I really remember. Each answer brings more questions to D's mind and I realised that we have been focusing too much on the how and not enough on the why. As the questions became more specific D's brush-baby KidzSonic Toothbrush and Tutti Frutti toothpaste arrived. D was very excited by the idea of a new toothbrush. So excited in fact that he attempted to brush his teeth with the brush still inside the packaging! I have no idea how he even managed to get the bristle of the brush to line up with his teeth. 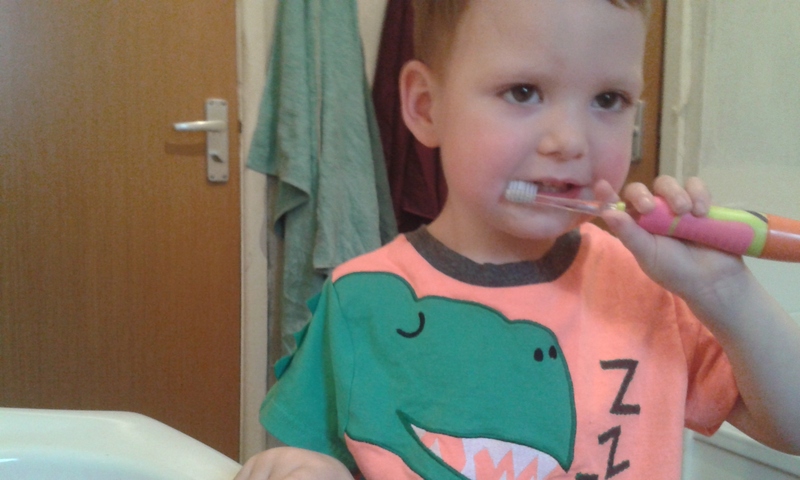 D immediately wanted to brush his teeth again so he could try his new brush out! While I was opening the package and getting the brush-baby KidzSonic toothbrush set up we talked about all the elements and how D could turn the brush on and off. Inside the pack we found that brush-baby had thought of everything and we where ready to get brushing almost immediately. The pack contained the KidzSonic toothbrush with one head attached, two replacement heads, one AAA battery and an instruction leaflet with the set up instructions and information in 4 different languages. The leaflet contained an image diagram of the KidzSonic toothbrush and information surrounding the image which detailed how to add/ replace the battery, change the head and how to turn it on. D had questions, he had a lot of questions. One he wanted to know right away was "Why is it broken?" I must say this one took me by surprise as to him it must have looked broken and it never occurred to me to explain that all toothbrushes are different and some you can change the top while keeping the bottom which makes it light up, vibrate and pulse among other features. The brush-baby Kidzsonic toothbrush has many features which include replaceable brush heads with easy remove mechanism that is a simple twist anti-clockwise and then pull up. This makes removing the brush head a fast and easy procedure. The brush heads can also be used for up to three months or until there is damage or it's worn which ever occurs first. This means that with the brush-baby Kidzsonic toothbrush you will be able to continue use without purchasing new brush heads for up to 9 months and new brush head pack which contain 2 heads will last up to 6 months.Another feature is the one twist battery cover for easy, fast battery changes.The cover is again an anti-clockwise twist. The brush-baby KidzSonic toothbrush has an easy push on/off button which children can push themselves. D loves that he can do everything apart from adding the toothpaste himself. This feature creates independence in children and a sense of excitement in D who loves the fact that he can make the toothbrush light up by pressing the button once. 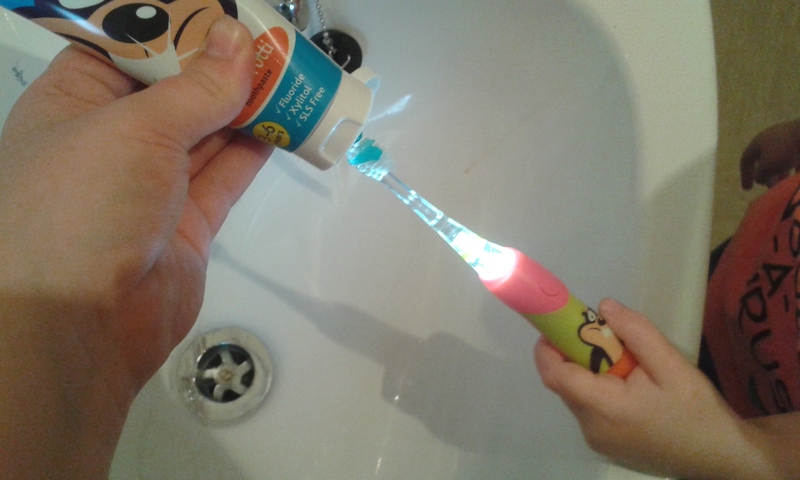 By pressing the button twice he can turn the toothbrush on cause the light to change through the colours in the rainbow as well as the all important vibrating and pulsing feature. The vibration of the brush pulses at 30 second intervals during the 2 minute brush time to signal that D should now move onto the next section of his mouth. The brush-baby KidzSonic toothbrush instructions tell you to divide the mouth into 4 sections which are the upper left, upper right, lower left and lower right to ensure optimal brushing. After the 2 minute the brush will turn itself off. I must say that although this is a fantastic feature and covers all the teeth I have always shown D that brushing his teeth involves full mouth hygiene and he will turn the brush back on in order to clean the roof of his mouth and his tongue with the toothbrush. I would say that perhaps brush-baby may be able to extend the time given for brushing slightly to include the tongue and the roof of the mouth in their next model. The brush head itself is made of flossing bristles which include small bristles (with a purpose of cleaning the surface of the teeth) and long bristles (with a purpose of reaching into the gaps around teeth and cleaning the harder to reach areas). I have noticed the difference the flossing bristles have made to D's teeth, he is still brushing lightly on his teeth however the longer bristles ensure that they are actually being completely clean and noticeably look cleaner which I really hadn't expected as he was brushing twice every day. It has shown me that moving to the KidzSonic toothbrush has made a lot of difference to D's oral health. The brush also has a grip on the back which helps to prevent the brush from slipping during brushing. This feature helped D maintain control of the brush-baby KidzSonic toothbrush at all times. The brush-baby Tutti Fruity toothpaste was very new to us, D has used a few different types of toothpaste with strawberry and mint flavouring however I noticed a much stronger smell of Tutti Frutti the moment I opened the toothpaste. It has a strong smell and a clear taste of Tutti Frutti which our previous toothpaste had been lacking. The mint we had been using before was strong but D hated it and only used it a few times as he said it hurt him. The brush-baby Tutti Frutti toothpaste contains Xylitol which fights acid-producing bacteria that causes tooth decay, it also contains fluoride which helps to strengthen the enamel on teeth. Together these ingredients create stronger teeth which are kept strong and in great condition by the protection of Xyitol with continued use. It is also SLS free, SLS is Sodium Lauryl Sulfate which is added to create the foaming action of toothpaste but can also irritate or create allergies, sores and bad breath! The toothpaste is a fun blue colour which D loves. All our previous toothpaste where white and D actually jumped up and down shouting "Wow" the first time I put the brush-baby Tutti Frutti toothpaste on his brush! Using the brush-baby Tutti Frutti toothpaste paired with the brush-baby KidzSonic toothbrush has given me the confidence to know that D's teeth are clean and protected every time he brushes. I had previously had worries that we may not have been doing enough to protect his teeth, I had been looking into flossing and also into mouth wash although D is too young for those options. 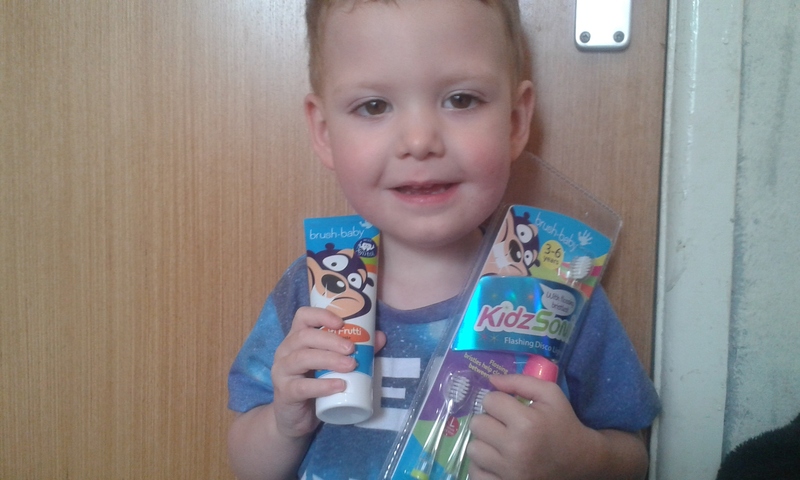 Overall we have loved the brush-baby KidzSonic toothbrush and Tutti Frutti toothpaste and it has made a significant difference to our brushing routine and to D's oral health. The features of both products have benefited our journey through brushing and prompted questions that D had not previously thought of which has increased his knowledge about brushing, teeth and oral hygiene. I would recommend both the brush-baby KidzSonic toothbrush and Tutti Frutti toothpaste to any parent with children who are between 3 and 6-years-old. Those children who have gaps, missing or crooked teeth would gain significantly more benefits from the KidzSonic toothbrush. Although the benefits that would be gained by all children in this age range is still great. I feel that both products are fantastic tools for both oral hygiene and for learning both how and about why we brush our teeth. The KidzSonic toothbrush and Tutti Frutti toothpaste make brushing exciting and encourage children to want to brush their teeth. You can purchase the brush-baby KidzSonic toothbrush (RRP £12.95) and brush-baby Tutti Frutti toothpaste (RRP £2.35) on the brush-baby website by clicking on the links. Disclaimer: We received both the brush-baby KidzSonic toothbrush and Tutti Frutti toothpaste from brush-baby in return for an open and honest review. All thoughts and opinions expressed above are my own.